So, a couple of weeks ago I went to Go Ape, and let me start off by saying that there is a good reason that they have you sign a disclaimer before you start. 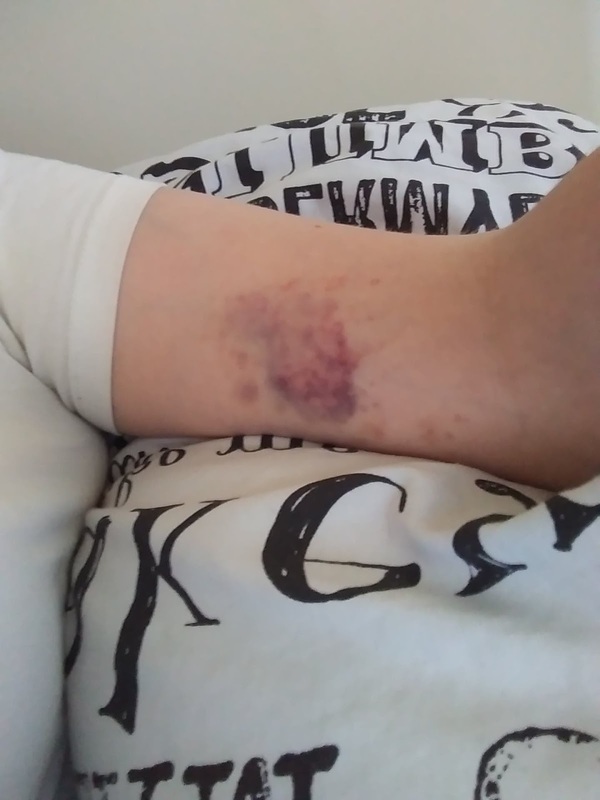 Of course every precaution is taken to keep you safe, but that didn't stop me from managing to give myself a massive horrible bruise. That being said it was a fantastic day. It was tiring and tough as hell, but so much fun. If you're afraid of heights it's probably not for you, but if you fancy an adventure climbing in the treetops and ziplining around, then this is exactly the day out you need. 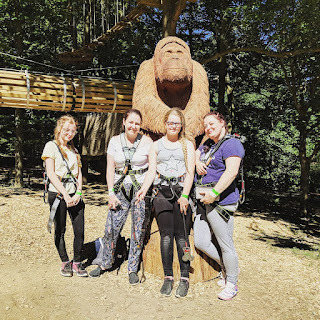 We went to the Go Ape in Temple Newsam, and we were booked in advance, however when we got there the booth said that they were fully booked for the day, so if you want to go then I would definitely recommend that you pre-book in order to avoid disappointment. There are 3 different levels, we did level 3 which meant we did courses 5-9. They were all different but required similar skills to pass. When we first got our harnesses on we went through a short tutorial about attaching and detaching ourselves. And then we just went to the starting point of the courses and went through each one. The first one we did I think was number 6, and it was pretty good, although there was one section where you could take the easy way or the hard way. As you can probably guess, I took the hard way. I don't regret it because it was tough in the best way, however it is the reason I ended up with my huge bruise. I had to go from ring to ring with my feet in them, and while I was trying to grab the next ring my arm slipped and got a bruise/rope burn, I'd do the same again though given the chance. Most of the courses involved a zipline at the end, and some were from tree to tree as well which was amazing. One of the courses ended in a vertical drop, which it is impossible to land gracefully, or at least it is for me since I completely lack coordination. My personal favourite however was definitely the Tarzan swing. It was pretty scary, and I wasn't 100% sure I could jump off without help, but I did it. It took 2 attempts to get up there since we had to come down at one point to let someone off that couldn't make the jump. Once we got up there though it was really high and you basically had to jump off the edge and then basically drop and then swing into a net, it was scary but amazing. Climbing up the net afterwards was a challenge though. Overall, I was aching, sore, and exhausted at the end of the day, but I was also exhilarated, happy, and quite proud that I managed it all. It was a great day that I would recommend to anyone, just make sure you really want to do it, because once you're up there you can only come back down by getting to the end. Owch! Now this one heck of a bruise! I am so glad you had an amazing time getting it though at Go Ape! Oh wow that looks sore! I did go ape last year with my eldest and we had the best time, despite me being terrified!! Oh I would love to go, but that looks a very painful bruise! 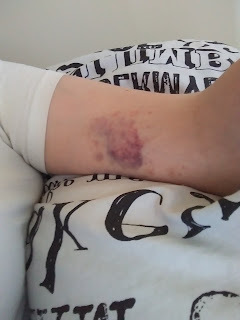 I often hear of people going to Go Ape and coming back with impressive bruising. I think it is actually part of the deal. It sounds like great fun and certainly something to challenge yourself to do. Must be really rewarding. Oh no, I am sorry to hear about your bruise but glad that you had a good time. I loved visiting Go Ape and somehow didn't have any bruises. Oh that bruise looks nasty, hope you body is feeling much better now and the bruise has healed nevertheless Go Ape sounds like an amazing experience. Sounds like you had a good time. Sorry to see you got such a big bruise though!